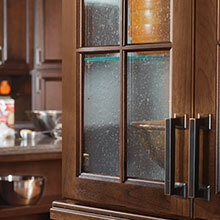 Cabinet accents provide depth and finish to your kitchen design. 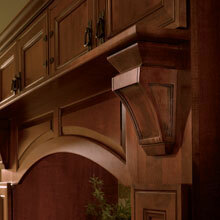 From crown moulding to corbels, these cabinet accents can support the selected design theme while bringing a quality of completion to any project. Glass cabinet doors are available in multiple fashionable designs to suit most any taste, from classic or antique motifs to the most modern, on-trend designs. Imagine your cabinet fronts transformed using art glass inserts, creating anything from the look of leaded glass to delicate, flowery swirls. Create a smart statement at a sink or cooktop area by supporting it with decorative legs that suit your style. If you enjoy furniture-type detailing, your designer might suggest a decorative foot application to the toe kick space on selected cabinets. 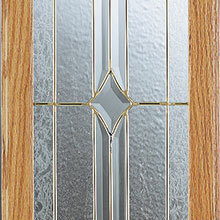 Gorgeous glass is all the more beautiful when it is combined with mullions made of wood or metal in a variety of patterns. Mullion cabinet doors can be used to give your kitchen an open, airy look while still providing closed storage that keeps items clean and protected. 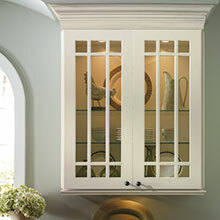 Decorative glass cabinet door options also include textured inserts with fashion-forward effects, such as bronze fabric, cocoa rice paper or metallic linen, as well as classic looks like reeded or frosted glass. Flat on one side, turned on the other, these elements allow your designer to embellish a tall unit by attaching the flat side to the face of an end panel with stile attached. 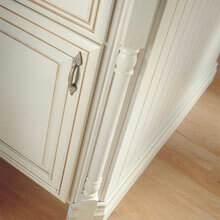 Similarly, they can add the look of a table leg to a bumped out area— such as a sink or a stovetop. While a decorative valance is commonly found above a window, they can also appear at the toe space of cabinets to create a furniture feel, or as the overhang of an island to provide a more finished look. Decorative onlays and inserts help to convey a theme within a room, accentuating your style. Typically more traditional, these details might be placed on the aprons of wood hoods, on a straight valance above a refrigerator or in front of a window. 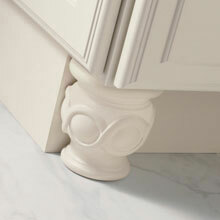 Corbels are key to countertop support. 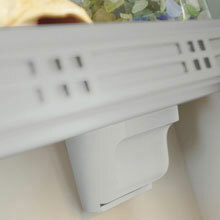 For example, when selecting a heavy granite top, there must be a corbel support every 36”. 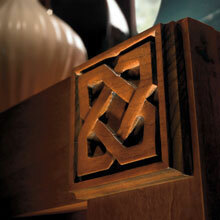 Choose from a stylish array of corbels that suit the design theme of your room.